One of the most common models in HR analytics is shown in Figure 1. The model starts with the data, then you draw insights, and finally tell a story. This isn’t entirely wrong; it’s just not the best way to approach analytics and it’s caused some heartaches for HR professionals trying to do the right thing. Here is how this model usually plays out: An HR professional is given a report, usually data drawn from the HRIS, and is asked to look at the data, derive an insight, then tell a story. Normally, HR professionals find this very hard to do, not because they lack the right competencies, but because it’s genuinely difficult to find legitimate insights in rows of numbers and figures. Even if you were a data scientist with lots of data, tools, and time, it would be a challenge to find insights that would have an impact. The secret to success is this: The story lies in the business issue, not in the data. Let’s imagine you have the following business issue: customers at a consumer electronics chain complain that the staff don’t know very much about the products. Everyone seems to have an idea why this is happening: Some think training is poor. Others think customers have unrealistic expectations. The regional head thinks it’s because turnover is high, which has left the stores with inexperienced staff who don’t know the products. The regional head is pushing HR to improve retention so that stores have more highly experienced staff. We now have the right starting point for analytics: a business issue followed by several hypotheses about the cause of the issue. HR may be lucky and have complaint data for each associate so that they can directly test the hypothesis. However, it’s more likely that such fine-grained data will not be available. If this is the case, they might instead look at the number of complaints by store versus the average tenure at each location. This isn’t perfect, but let’s see how the insights and story might play out. Conclusion: We can’t be sure, but it appears likely that a big investment in retention would not solve the problem of customer complaints; something else is causing the problem. This list of bullets is the story HR is telling. The regional head is sitting on the edge of their seat because they care a lot about the business issue of reducing customer complaints. HR had little trouble drawing an insight from the data because they knew exactly what hypothesis they were testing. The story flows from the business issue, which then guides the data collection and analysis. 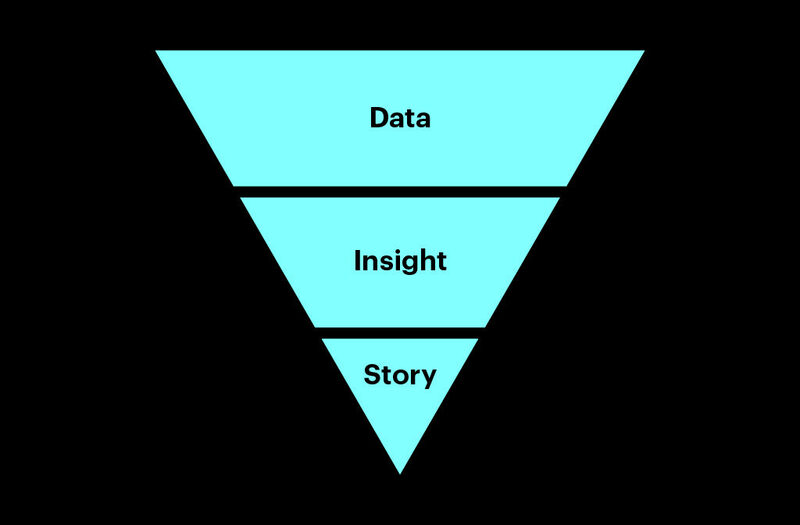 Why is the Data-Insight-Story model hard to give up?